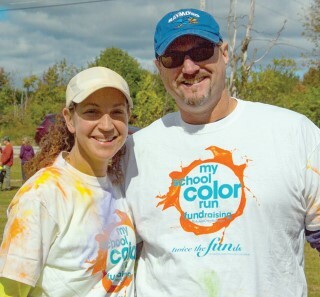 As the colors of autumn rolled into southern Maine last weekend, laying the perfect backdrop for Raymond Elementary School's (RES) 2nd Annual My School Color Run. The event, which raises money for much needed school supplies, was held last Sunday on the grounds of RES, featuring a beautifully maintained 1-mile course, made for all abilities. Last year's race drew nearly 240 participants. This year's event eclipsed that number, with approximately 265 competitors from Raymond and surrounding communities. "It's just a wonderful day for the kids, the staff and community of this great school," said RES assistant principal Deb Hutchinson before the race. The event is well organized, as last year's coordinator, Susan Brackett, was back again this year. "Looking forward to a great day,” said Brackett excitedly at race check-in. The race started sharply at 1 p.m., in mid-50 degree temperatures with a strong northwest wind. After a moving rendition of the Star Spangled Banner by the RES Chorus, the racers consisting of walkers, joggers and runners were off. The course started alongside the RES soccer field, and then took the competitors into the surrounding woods onto well groomed trails. Once out of the woods, they made their way back toward the soccer field, and it wasn't long before the first finishers started to arrive. This year's first place finish goes to Jordan-Small Middle School student Garan Laszok, who is in sixth grade. Arriving behind him, in second place, was Raymond first grader Sean Lebel. Just behind him was Raymond fourth grader, Harrison Benke, taking third. Shortly after the race, Benke spoke on running this year's race. "It was awesome, I finished 14th last year, so I wanted to do better. 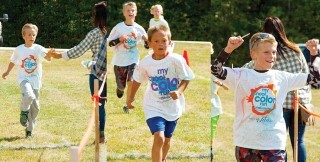 Going through the color splash zones was cold, but fun,” he said. Jani Cummings, a former teacher at RES, who just retired at the end of last year after nearly 40 years of teaching, was on hand to volunteer for the race. "I had great fun splashing everyone in the color zones! It's amazing to see so many wonderful people come out to support their community's school,” she said. everyone to throw their color packet into the air. Counting down from three, the air was soon filled with every color imaginable, and the swirling wind took the massive color cloud across the field. 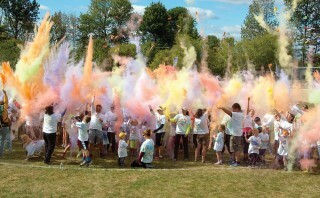 The color-soaked crowd of various ages were all smiles once they appeared from the center of the field. It was certainly the successful day Brackett and the host of volunteers had hoped for, as the silent auction and bake sale both did well also. The event raised nearly $3,700. "It makes me so happy to see all the students, families, teachers, administrators and community members come out to support RES. These first two years are off to a great start, and we hope to continue to make it bigger and better. Thank you to all the volunteers for their hard work to help make this fun day a huge success," said Brackett.